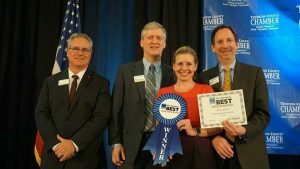 It has been smooth sailing for Washington Business Bank in downtown Olympia as they celebrate yet another year of being voted the Best Bank in the South Sound by readers of The Olympian in their annual Best of the South Sound contest. It is a huge vote of confidence for one of the few, truly local banks in the area to be recognized by their community five years in a row. 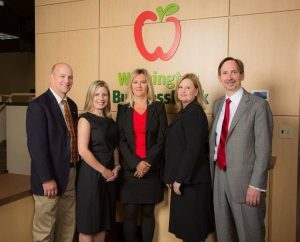 Their mission statement really sums up their philosophy stating that “Washington Business Bank provides financial services that enable our clients to become more successful.” How are they meeting this lofty goal? No one knows better than long-term client and restauranteur, Patrick Knutson who has been trusting them with his business for over 12 years. Since then Knutson has opened the newly remodeled and re-tooled Olympia Oyster House to rave reviews from their customers. Washington Business Bank is thrilled to be a part of bringing back an institution that means so much to long-term residents who have been regulars of the eatery for decades. The Olympia Oyster House is an important anchor in the revitalization of the downtown core that Washington Business Bank calls home. After a record year in 2018, which resulted in the highest earnings since their grand opening in 2002, along with double-digit growth in both loans and deposits, Washington Business Bank is now offering an investment opportunity to members of our community. “It has just become easier to own a piece of a successful community bank. Washington Business Bank’s common stock has begun trading on the OTC marketplace under the symbol WBZB,” shares Jon Jones, President and CEO of Washington Business Bank. With the continued growth and financial success of the bank, the Board believes that offering an efficient way for shareholders to trade stock is a natural step in their evolution. If you are looking for a place to invest your money knowing that your investment will stay in your community, WBZB might be just the right choice for you. At a time when people are making more deliberate decisions about their investments, a community bank is a great choice. When you invest in Washington Business Bank, you are providing the capital that drives our local community and creates jobs here. As a Small Business Administration preferred lender, the bank is investing in local residents and their dreams every day. Buying stock in Washington Business Bank is a decision to use your money to create success in your own community. Unlike many larger corporate banks, all the decision-makers are under one roof, right here in Olympia with a great understanding of our local market. “Being a business bank, we are experts in what businesses need to get started and to expand,” explains Jones. All employees are local residents who enjoy living and working in the South Sound. Joanna West, VP and Marketing Director, loves working in downtown Olympia. “We really see the potential in downtown and enjoy walking to local restaurants for lunch or being able to pop out after work to pick up a gift at one of the unique shops nearby,” she shares. Washington Business Bank is a proud sponsor of many local non-profit organizations including the South Sound YMCA and Big Brothers Big Sisters of Southwest Washington. President and CEO, Jon Jones serves on the South Sound YMCA board and is a past Board Chair. West is a familiar face at many local fundraisers and currently serves as the Chair on the Thurston County Chamber Board of Trustees. 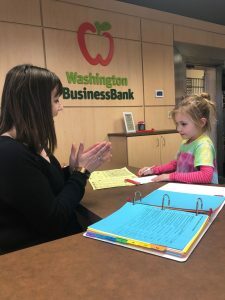 Experts in the banking business and knowledge of our local community along with a parking lot and drive-thru make it easy to choose Washington Business Bank. Their investments in our community and ability to be an engine of our economic success make them a smart choice. For more information, including how to purchase stock, visit the Washington Business Bank website.